This listing below was initially provided courtesy of Roger Young, Editor of 'The Guidon', which has now ceased publication, following acknowledged assistance from fellow members of the English Westerners' Society. It is now being updated but if some of the links no longer work and if members are aware of the new links we would be grateful for an update. The American Museum in Britain is based at Claverton Manor, near Bath ~ 01225 460503 The Native American collection now on display. A Heritage Lottery Fund grant supported the redevelopment of the basement, which houses this collection. It includes; new state-of-the-art exhibitions, a lift and climate control. Birmingham Museum Chamberlain Square, Birmingham ~ 0121 235 2834 On the left is a Elk Antler Scraper fashioned from the thick section of an elk antler, they were traditionally used by Indian women from the North American Plains for scraping animal hides. An iron or steel blade was attached to the L-shaped end and secured by means of rawhide thongs. 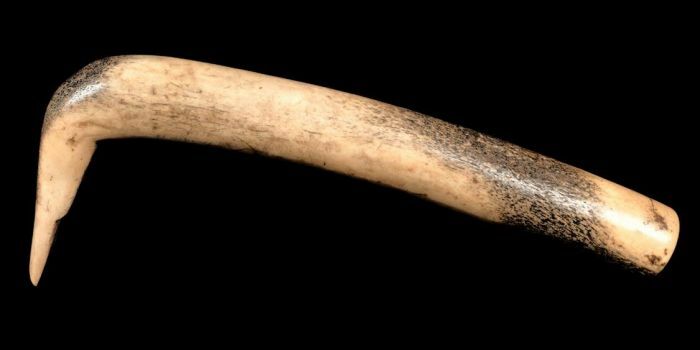 The handle was often marked with a series of incised lines and / or dots to indicate the number of hides tanned. British Museum Bloomsbury, London ~ 0207 323 8599 The Museum is free to all visitors and is open daily 10.00–17.30. The Museum's North American collection that is on display can be found in Gallery 26 which is on the Ground Floor. 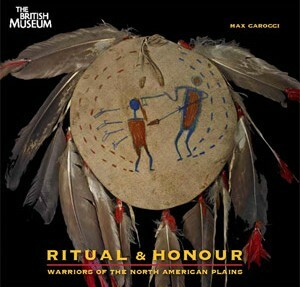 The Museum book shop had a book entitled Rituals & Honour: warriors of the North American Plains by Max Carocci. (Priced at £9.99, ISBN: 9780714115429) when I visited in 2011. Cambridge University Museum Museum of Archaeology & Anthropology ~ 01223 333516 The collections of the Museum of Archaeology and Anthropology number more than 750,000 objects of outstanding research and historical value. In addition there are over 100,000 field photographs and negatives in the Photographic Archive. The Museum's Anthropology section holds large and unparalleled Pacific collections (over 30,000 artefacts), including 18th-century material from Captain James Cook's voyages of exploration. 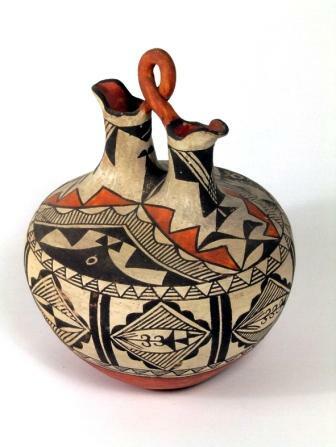 There are particularly fine 19th- and 20th-century collections from Fiji, Vanuatu, New Guinea and the Torres Strait. 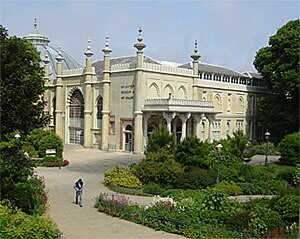 The Museum also has major collections from Borneo, Malaysia, India, Uganda, West Africa, Amazon, Mexico, North American Plains and Northwest Coast, and the Canadian Arctic. There is also a unique collection of artefacts of British folklore. Exeter Museum 01392 665858. 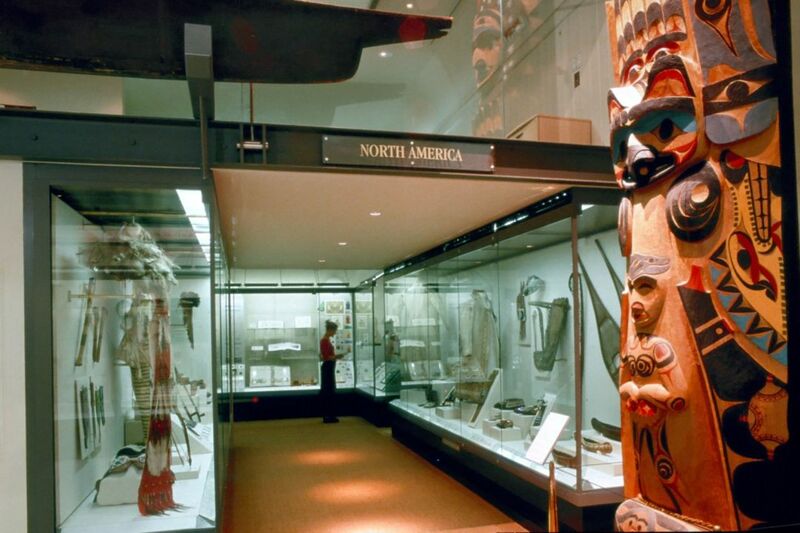 The Museum has over 500 American Indian exhibits which include objects from First Nations peoples of the Northwest Coast region of North America cover two centuries. The earliest were collected in the late 18th Century by members of Cook's voyages, also from Vancouver's voyage of 1790-95. These are complemented by a specially commissioned Nuu-chah-nulth totem pole created in the museum in 1998, with a video of the creation process and accompanying songs, dances and ceremonies. Objects from Edgar Dewdney were obtained between 1879 and 1885 from communities in the Sub-Arctic, Northwest Coast and Plains regions of North America. Hastings Museum John’s Place, Cambridge Road, Hastings, East Sussex ~ 01424 781155 - Now reopen with vastly expanded area dedicated to the North American Indian collection. Closed Good Friday, 24th to 26th December and 1st January. 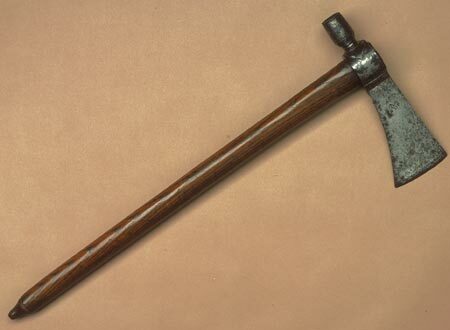 Liverpool Museum 0151-207-0001 The Pipe tomahawk. Possibly Lakota, Dakota or Nakota (Sioux), Plains, Central USA, 18-19th century. Steel, wood. (Accession Number 54.) is one of a number of artefacts held in the collection of the Human World, World Cultures section of the Liverpool World Museum. The anthropology collections number about sixteen thousand artefacts ranging from American Indian stone tools to Japanese ivory carvings. Owing to the limited display space only a relatively small proportion of this material can be exhibited at any one time in permanent and temporary exhibitions. 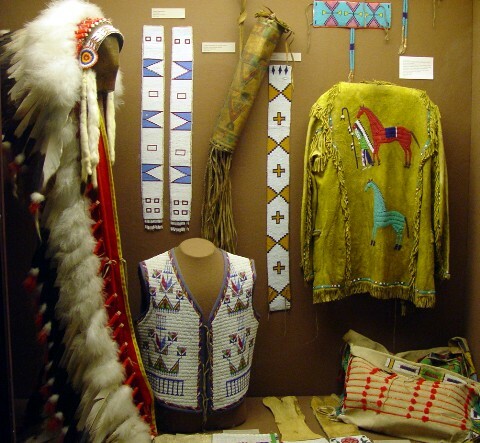 There is a significant American Indian and Arctic (Eskimo and Inuit) collection which includes nineteenth century Plains Indian clothing. An example from the collection is on the left. The body of the pouch is triangular with the opening along one side. From the opposite apex hangs a fringe of strips of skin, the upper halves wrapped with coloured quills to form a lozenge pattern. 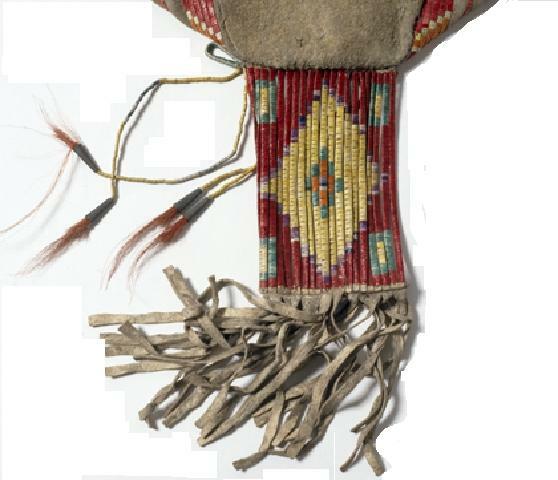 The body of the pouch is decorated with dyed quills (red, yellow, blue) in geometrical patterns. Pitt Rivers Museum Oxford ~ 01865 270927. 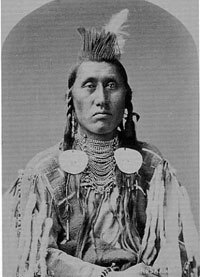 To visit the Collection of Native American Indian Photographs Collection click here. The image on the right forms part of the collection and is a photograph of Pretty Eagle. The Museum’s North American material, whilst more limited than that found in North American collections, is nonetheless one of the most significant in the UK, including a series of early portraits of chiefs who visited Washington DC in 1856-7, portraits by C. M. Bell before 1884 and J. Hillers’s photographs from the US Geological Survey to the southwest in 1878. Saffron Walden Museum 01799 510333/4 The Museum has a collection of about 3,500 items, many acquired in the early 19th century. Some objects are of international significance, especially those from Polynesian, Aboriginal Australian and North American native cultures. This museum houses the Saffron Walden Scalplock Shirt which was the subject of The Brand Book Volume 34, Number 3, Summer 2001 by Neil Gilbert. Any missing or changes? Email the Webmaster with details.